It’s Out! 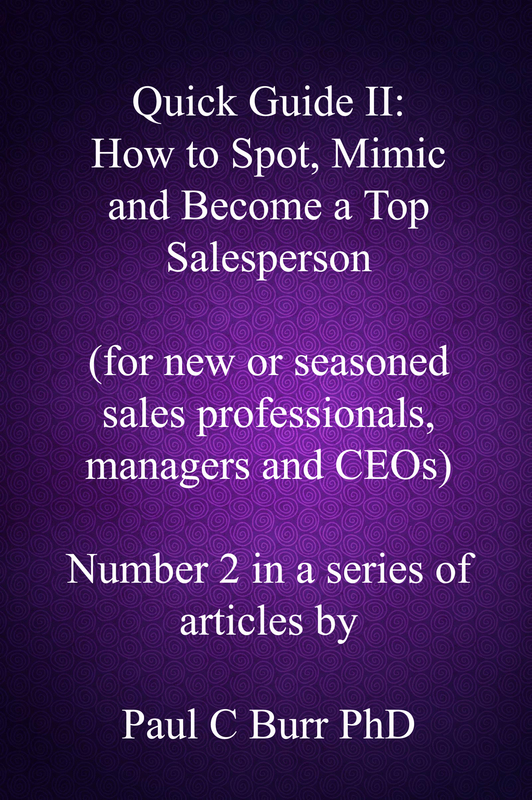 Quick Guide II – How to Spot, Mimic and Become a Top Salesperson. Available from Amazon in US, UK and Smashwords in Kindle, paperback and e-book versions. Over and above exemplary sales achievements how do ‘you’ (by ‘you’ I mean: you, me, us, we) spot a top salesperson when you meet one? Top salespeople come across differently. There’s a resonance to their mannerisms. If you want to sell as well as they do, how would you go about it? If you were to ask the same questions and give the same answers as they do, would that be enough? No, because you bring your own personality and mannerisms into the equation. It requires the wisdom and will to nurture 7 key traits by which top salespeople outsell ‘moderates’. This series of ‘Quick Guides to Business’ is borne of research, direct selling experiences and coaching in some of the world’s largest companies including: IBM, Xerox, Cisco, BP, American Express, Standard Chartered and Reckitt Benckiser. I chatted to two advisers about a business book that “I have inside me”. I had original research and experience inside my head. I had data. It delves into people’s effectiveness at strategic and personal levels. I’d developed simple but powerful business frameworks and a scorecard that take people’s feelings, motivations and fears into account. They reveal what happens below the surface of successful business relationships at their outset – and what needs to happen for those relationships to thrive. I had a lot to tell but would the busy-business people, it’s aimed at, read it? So I tested my ideas and scope for ‘the book’ with two wise confidants. Subsequently, I gave a series of briefings to business audiences and post-graduates. The talks were very highly received. The University of London asked me back to talk to a wider range of postgraduates in business-related studies. I am due to go back a third time. March 2013: I set about writing a series of Quick Guides. Each would have about 10-15 (A4 size) pages of findings, tips, self-help tools and insights into specific topics. The majority of my work focuses on what top performers do differently from ‘moderates’. I’ve started in sales and sales management, an area in which I’ve coached hundreds of individuals/teams and conducted research – across Europe, the Middle East and Asia. The first two guides reveal ‘the what, how and why’ top salespeople outsell ‘moderates’. They sequence activities differently. They come across differently. They attune their approach to the most senior of clients resonantly; ‘moderates’ do not. 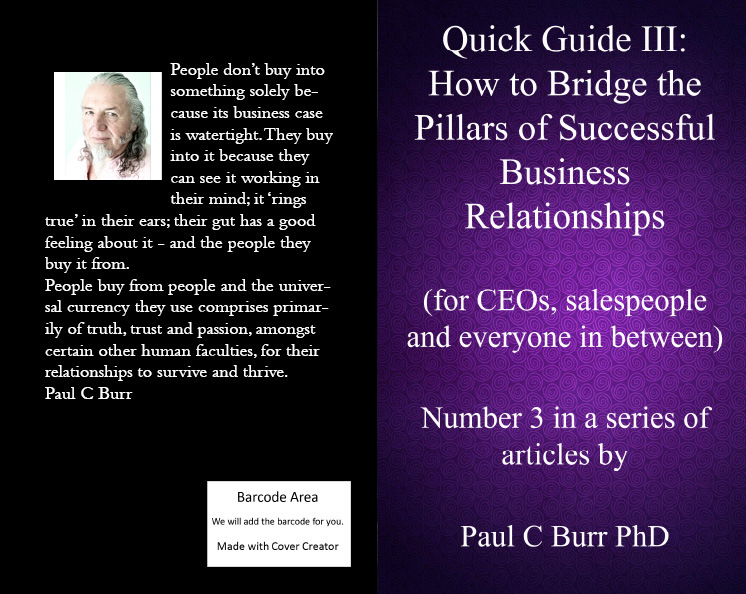 My next and third Quick Guide… will reveal what needs to happen for business relationships to thrive over the long term. This 17-page article (A4 size, excluding appendices) bears from my research, consulting, direct selling and coaching within global corporations over a twenty year period. The aforementioned 7 key traits are what really differentiate top performers from ‘moderates’, more so than behaviours in that they predict whether the salesperson will be successful selling directly to C-level clients. You can spot a top-performer or high-potential individual by noticing how much they demonstrate these 7 key traits. These key traits are nurtured not ‘trained in the classroom’; the nurturing process can be accelerated by equipping yourself with ‘non-expert’ coaching tools, such as in Appendix 2 – Prepare to Be at your Peak in Every Meeting. “When you’re selling at board level it’s about taking the customer on a journey that’s both fantastic and believable. That is, no matter how complex that journey is…, it’s about breaking it down into manageable chunks. You create a pathway into the future that is as clearly marked out as possible. There will be uncharted territory. So it’s about discerning all the parts of the map that are known from those unknown. 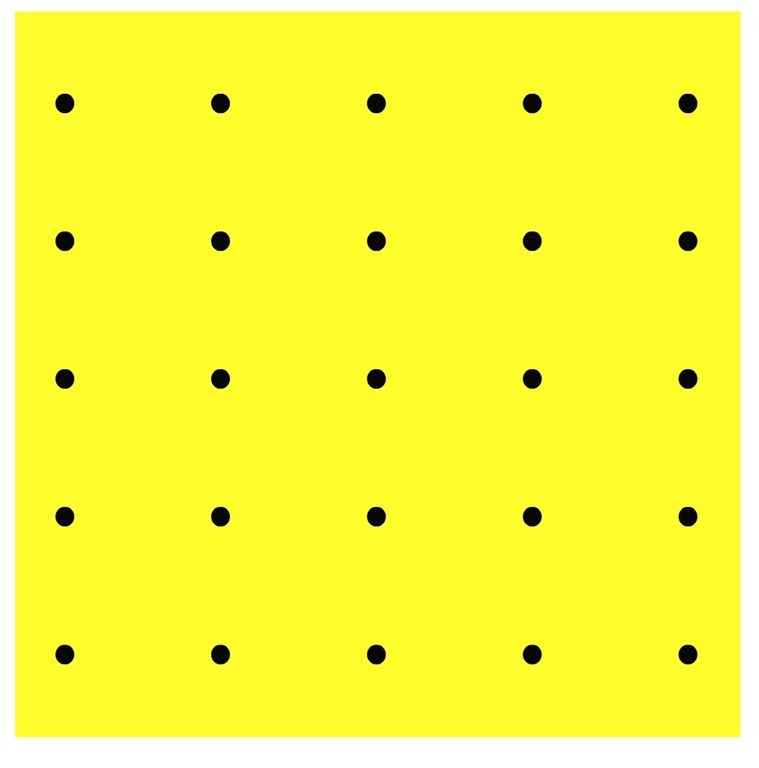 It’s then about pinpointing all the ‘dots on the chart of the unknown’. That is, answering all the ‘what if this happens’ questions. The ‘science’ to determine value discovers what’s important to the CEO. And once you understand the customer’s priorities – how do you stack up (against your competitors) to deliver against them? • Cash – Will your proposal improve our cash position? • Cost Down – Will we reduce costs? • Revenue/Market Share Up – Will we make competitive gains? • Agility/Speed – Can we move, reshape, transcend quickly? • Security – Will we be better protected? • Governance – Am I compliant with Company Law? • Product/Service/Cost Leadership – Will our own customers notice and value the changes in our organisation that your proposal offers? • Innovation (e.g. Technology, New Business Models) – Do I want (to be seen) to be first in the marketplace, to do something differently? Does your proposal accelerate the process? • Personal Credibility – Can I use your proposal to advance my own prospects and standing? • People – Will your proposal raise the effectiveness and job satisfaction of people? • Something else? – If you don’t know, ask “What else do you feel is important for me to know?” Even if you feel you know, ask anyway. Put concisely, you need to understand profoundly what’s important in the heart and mind of your CEO client and convey the value you bring to the table in their language, not yours. At this stage you may have provided sufficient verifiable value for the CEO to progress the sale. And there’s often a temptation to press on. In doing so, you may miss another, often unspoken, factor that weighs heavily in the CEO’s mind (as well as most of us) – fear. The more you earn a customer’s trust, the more fears they share with you. They give you more power deliberately to help them. My thanks go to Professor Colin-Coulson Thomas who shared with me the bounty of a minute fraction of his wisdom, and made a significant contribution to the following list. • Bad earnings news: the most likely and quickest sign of departure. • Corporate programs don’t deliver: mergers and acquisitions “achieve 70% of their potential” at best. 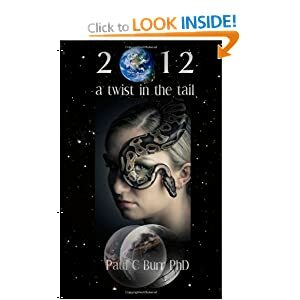 • Failure to turnaround ailing sales quick enough. • Change takes too long: ‘corporate firewalls’ prevent people from getting it done. • Investors don’t understand: a CEO spends 40% of their time articulating strategy and some argue that’s not enough. • Lack of innovation: playing it safe is no longer an option these days. Competitors and customers are moving too quickly. • Talent gaps in performance: e.g. 20% of the sales-force bring in 80% of the revenue. • Conflict in the boardroom: too much time spent looking inwards leaves too little time to focus on the customer. • Personal health at risk: where the stressed mind-body connection can have serious consequences. I know of one CEO who, after missing targets set by investors, developed terrible eye problems because he didn’t like what he saw. Another developed disabling back pain through a lack of self-esteem. Another who was deemed too rigid and inflexible developed problems with their joints. 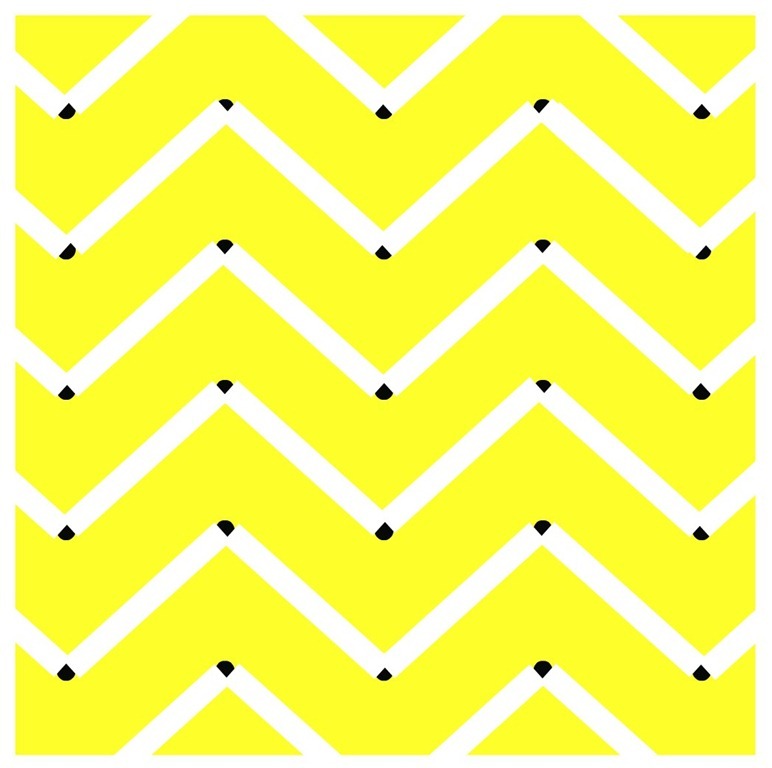 Your task is to earn the right to zig-zag; to take the CEO on a journey whereby they see your solution working in their organisation and have allayed any fears they once had. Ebooklet – Quick Guide: How Top-performing Salespeople Sell – for new or seasoned sales professionals, managers and CEOs. You can now download this first in a forthcoming series of business articles from Smashwords.